Content for companies comes in a few different forms: web copy, product descriptions, captions, video descriptions, blog posts, and more. Although the internet makes it seem like video is the future and the only way to drive business, just because we (also) recommended that some video content should be incorporated in your 2019 marketing strategy, that doesn’t mean blogging should be ignored. In fact, one of the most important types of content for businesses is blog copy. Here’s why blogging matters and best practices. Blogging really pays off. Of all of your efforts (think our bullseye marketing approach discussion), content marketing (i.e. blogging being part of that) will often generate the most ROI. Content marketing keeps your audience interested, it builds brand awareness, it generates leads and leads to direct sales. 72% of marketers say that blogging increases engagement, according to the content marketing institute. HubSpot notes that business websites that blog have 434% more indexed pages in search engines than those who do not blog. 66% of people use blogs to make their business to business purchase decisions. Business to business marketers use blogs to generate 67% more leads than non-bloggers. Those who prioritize blogging are 13 times more likely to gain positive ROI. Content marketing has lower upfront costs and has better long-term benefits than paid search. 70-80% of searchers focus on organic results over paid ads. Blogs have been rated the 5th most trusted source of accurate information. Companies who blog more perform better–those who blog 16 or more times per month generate 4.5 times the traffic of those who publish 0-4 monthly posts. And total blog posts exponentially help your business generate leads over time. 60% of consumers enjoy reading company blogs from brands they enjoy. 90% of users find custom content helpful and useful. It’s plain to see that people like blogs from companies and it’s a useful part of your overall marketing strategy. What’s the purpose of blogging? Blogging builds trust and brand awareness. 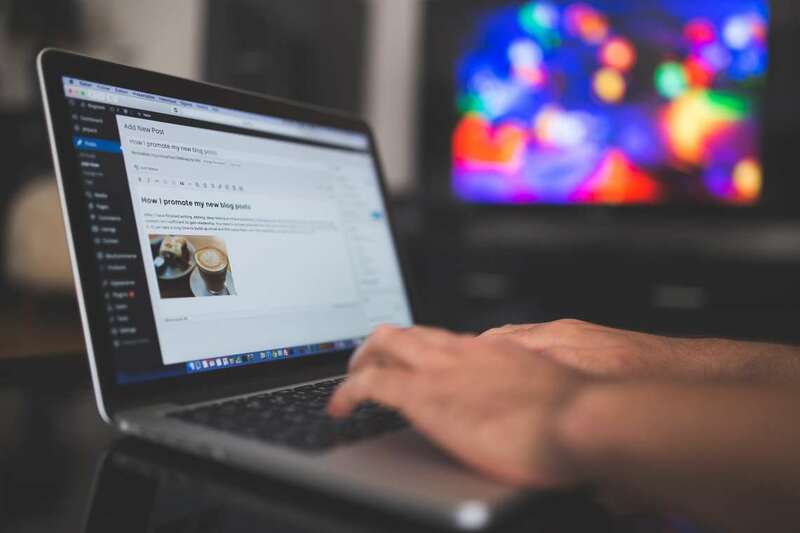 Blog content is there to educate prospective customers and clients regularly to help them and to lead them towards your product or service as a solution for them. Overall for your company, companies who blog gain 97% more inbound links to their websites than those who do not blog. Since inbound links not only help people find your website but they also help Google see you as credible and trustworthy as well as increase domain authority, which is all overall a positive net effect for your business. Furthermore, blogs can help you reach the first page in Google, which is important since many users (75%) do not go beyond the first page of the SERP. One of the best reasons to blog is that content marketing generates 3x more leads and costs 62% less than traditional outbound marketing methods. Blogging may have an upfront expenditure, but it can work when you’re sleeping. You could make 100 calls a day and hope that 3% of those leads convert into customers or you could be passively gaining followers, building up your brand recognition, being seen as an industry expert, and helping potential customers with your content–all because they’re reading your blog. You may have hundreds of people read a blog post, some may share it on social media, others may subscribe to your blog or email list, others may be convinced enough to buy a product–either way, you’re creating a way for people to interact with your brand. The type of blog post can help nurture potential customers into actual customers. You want to write the content that not only appeals to your readers (your customer personas) but also answers their queries. Your blog should not be a platform to blast how awesome you think you are as a business. You may very well be, but if you’re not showing how you can help your reader achieve their goal, solve their problem, or make their life more interesting, you aren’t giving them value. Good blog content should add value to your reader whilst–hopefully–solving their problem or helping them along the way to solving their problem. Maybe you’re a bakery and you’re targeting kids’ parties and birthday cakes. A father whose child’s birthday is in a month has been tasked with baking a cake for his son’s birthday and has come across your blog about how to bake a cake for a three-year old’s party. You give comprehensive instructions and advice on how to bake a spiderman cupcake tower, but at the bottom you also say that ordering a custom cake from you saves you time and effort (if not money), so that father clicks on your pricing options, you live in his local area, the prices are reasonable, and now you have a customer. If you deliver a superior product on that day, that customer may well be ordering a cake for his mother’s upcoming 70th birthday party too. So, the bottom line is you should write content that pertains to your business, but is also helpful to your reader and will nurture them (eventually) into trusting your brand and purchasing your product or service. Here are some best practices to get you started. Write long-form content. The average Google first page result has about 1,890 words. Long-form posts generate more conversions–up to 9 times more leads than short-form. Answer questions your customers are looking for; what are the pain points of your buyer persona? Figure out their pain points and answer their questions. Use long-tail and short-tail keywords to ensure you’re ready for voice search. Optimizing your content for different keywords will up your chances of being found and indexed on Google. Plus, if Google sees you as particularly helpful on a certain topic, your rankings will increase. Take a look at how your blog looks on mobile; make sure your blog is also optimized for mobile as many readers will read on their phone. Make your blog content skimming-friendly. 43% of readers skim blog posts looking for the vital ‘answers’ to their query, so use headers, videos, and visuals to help readers understand what you’re saying. Repurpose content: you can turn one idea into a video, social media post, blog, content download, infographic, meme, and more. Write content for each stage of the marketing funnel: awareness, consideration, decision. Awareness stage blogs are blogs about helpful content that your reader wants to know about. The content doesn’t specifically have to relate to your business’s services. For example, if you’re a hair salon, you might just write about ‘10 easy hairstyles for the office’ to get your reader interested in your brand. You aren’t going to try and sell them your in-house shampoo at this stage. You’re just writing the content to be helpful. You can ask them to subscribe to your blog. You want to ask them a simple next-step action that doesn’t cost them anything. Consideration stage blogs are blogs that start to establish you as a trusted brand. You want to get your reader to realize that your product or service can help solve their pain point, but it’s still not a hard sell. At this stage, you hopefully have some information on this customer–an email address, for example–and you will start nurturing them into a lead (a buyer). This stage is the longest in the funnel and you have lots of work to convince this customer that you’re the right company to solve their problem. You want to find out, in the salon example, do they suffer from dry scalp? Do you have a product that can help them? In that case, you might have five blogs around the topic of ‘How to treat a dry scalp’ and you’re going to nurture this customer towards your product. Decision stage blogs are more of a hard sell (but not too hard–blogging isn’t a ‘sales’ tactic as such). In this stage, you more definitely push your product as the answer. The customer has likely compared lots of different shampoo products and you’ll want to show them why yours will solve their problem. You might want to show them customer testimonials with the salon example to help convince this potential customer that you’re the one for them. Other ways to entice customers at this stage are with free trial offers or samples–anything to convince that customer to buy your product or service–but in a way that they’ll be left satisfied. Now that you know the types of content you should write, who you should write to, and what you should say, what are you waiting for? Get started on your blog. You’ll be glad you did. Need content writing services or to set up your blog? 62% of companies outsource their content marketing. Nearly every company feels that blogging is an excellent value for money, generating ROI and giving you insights into your customer base. If you aren’t sure where to start and want a consultation on generating ideas for your blog or getting you started, get in touch.